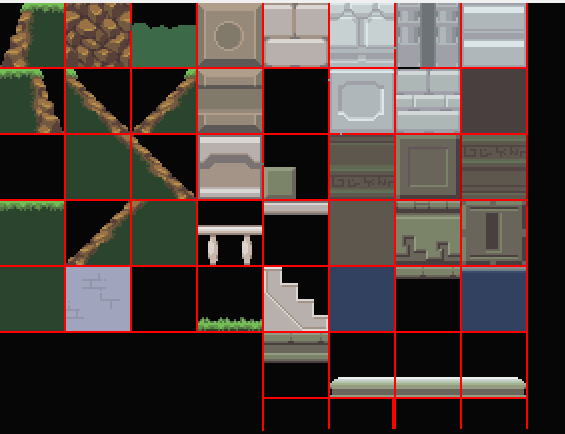 Anyhow, here are some examples of 32 x 32 tiles I've done so far. 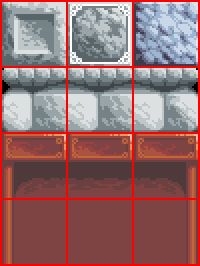 Lately I've been trying to make tiles with a bit more texture to them. Before now, some of my tiles lacked texture, so they came off as a bit too metallic. As an example, this was a tileset from Crimson Brave. As you can see, some of those stone blocks may as well be chunks of steel, given their color. I actually still have that Crimson Brave demo somewhere on my computer. As for the tiles I notice a major increase and detail in the newer stuff, keep up the amazing work, dood! Which version do you have? Despite what Kyrieru seems to think, I still think the demo for that wasn't bad. I have CB_test2. I had no problems with Crimson Brave as a game. I just felt a bit limited by the sprite proportions, in terms of H content. Any idea if you may re-use some monsters from that, just re-sprited? I thought the plant monsters from that demo were good enemies. As for the version, I got CB-test2 as well. Don't take this the wrong way - tiles are pretty uninteresting. I needed to preface that because it's still super-cool to see any hints of progress - lets us know you're still alive! Yea fair enough i can see what you mean, but hell now you have tiles for metallic areas too. Mmm the shading in the new stuff does give it a stone-like texture, making it seem somewhat uneven. All in all it just looks like higher quality work in fact if i hadn't known i would have said it was made by different people, this shows a marked improvement. As expected from a game dev of your your caliber. New tiles look wonderful. Thanks for the update.